RUSTY, FLAT, AND FLOUR MILL BEETLES Cryptolestes spp. These insects are often grouped together as “flat grain beetles” or “brand bugs.” Technically they are the rusty grain beetle, C. ferrugineus (Stephens), the flat grain beetle, C. pusillus (Schonherr), and the flour mill beetle, C. turcicus (Grouv.). All three species are reddish brown and about 2 mm (1/12 in.) long. 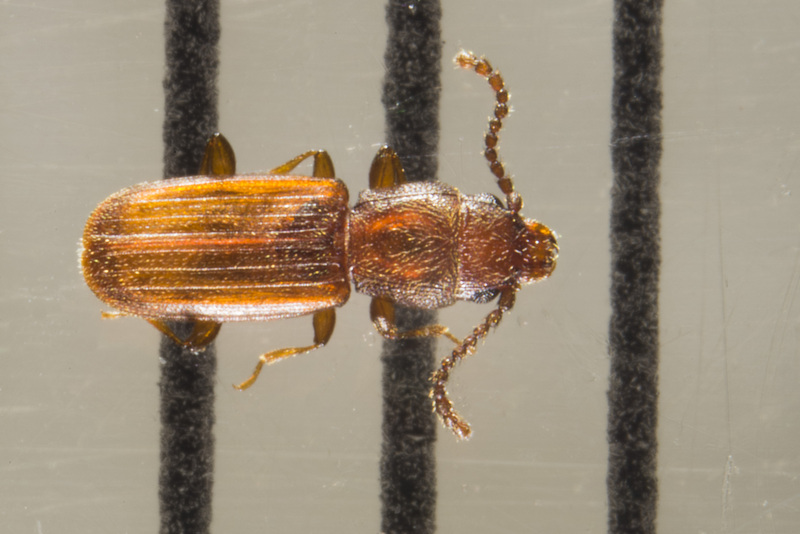 The flat grain beetle is slightly longer. The beetles are flat, quite shiny, and have long, slender antennae. The antennae of both male and female rusty grain beetles are about half the length of the body. The antennae of the males of flat grain beetles and flour mill beetles are more than two-thirds the length of the body. The prothorax of the rusty grain beetle is narrowed at the back, whereas those of the flat and flour mill beetles are more nearly square. All adults are strong fliers. Larvae (3 mm, 1/8 in.) are white and somewhat flattened, with the posterior part of the body slightly broader than the anterior half. The head and a distinctive forked process at the tip of the abdomen are slightly darkened. Eggs are deposited singly in crevices or furrows in kernels of grain, in space between kernels, or in debris. They are white, average 0.5-0.8 mm long, and are about 3.5 times as long as wide. Larvae burrow into kernels of grain but may leave their burrows in search of more favorable food. There are 4 larval instars, the last of which forms a silken cocoon. Larvae infesting whole grain often form cocoons in chambers within the kernels. Before chewing their way out, newly emerged adults remain within the cocoon for a few days. 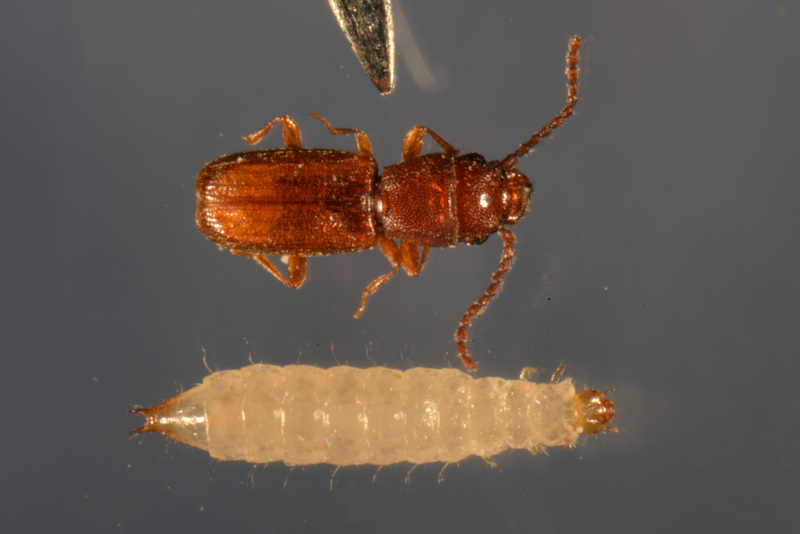 Development from egg to adult varies between species, with rusty and flat grain beetles taking 22-24 days at 32-35˚C and 75% RH and the flour mil beetle requiring about 30-35 days. The rusty grain beetle is more cold tolerant. Adults, as well as larvae, are cannibalistic and will consume eggs, pupae, and prepupae of their own kind. At 25˚C and 75% RH, females begin laying eggs within 4 days after emergence and oviposition continuous for more than 34 weeks. Oviposition rates vary during the egg laying cycle, but there is no marked peak, and only a slight decline towards the end. Average fecundity is 242 eggs per female. These beetles can be found feeding on grain and cereal products as well as a variety of other materials. The rusty grain beetles have been recorded from wheat, flour, oilseeds, cassava root, dried fruits, and chilies; the flat grain beetle from wheat, corn, rice, barley, cottonseed, copra, coffee berries, bulbs, and nutmeg; and the flour mill beetle from copra, cocoa, chilies, and nutmeg. Larvae feed preferentially on the germ of the whole kernels, but they also feed on the endosperm and sometimes hollow out the entire kernel. Growth of mold in the endosperm renders kernels more suitable as larval food. In general, molds in the diet also favor development of the flour mill beetle. Cryptolestes species are apparently unable to feed on sound grain, but they can feed on kernels with very slight imperfections or injuries.